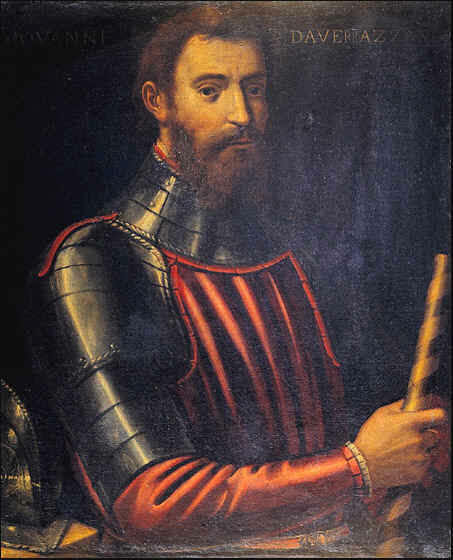 In writing “Keepers Of The Bay”, I realized that one of the first points of inquiry would have to be early European encounters, including Verrazzano’s visit to Narragansett Bay in 1524. As many of you know, the evidence that the explorer even visited the new world, based upon a letter he wrote to France’s James I. was a point of contention among early scholars. Although the original has not been found, the explorer also sent copies of the letter to friends after his voyage. Three copies of this letter have been found. The first was published in 1556 by Ramusio in his collection of Voyages. This version of the letter was reprinted by Hakluyt in his Divers Voyages of 1582. Another copy of the letter was found in the Strozzi Library at Florence, and this version, containing a cosmographical appendix which did not appear in the Ramusio version, was printed in 1841 by the New York Historical Society with an introduction and notes by Dr. J.G. Cogswell. A third copy was found and printed in 1909. Historian George Bancroft seems never to have been convinced of the authenticity of these letters, or at least their content. He withheld the explorers name from his History of the United States (1834-1874), contending that the explorer had never visited the Americas, and that the letters were simply written in France to enhance that nation and King’s prestige during this competitive age of exploration. The contents of this much debated letter give an account of his journey to the coast of North America and exploration from 30° to 50° N. latitude. It has been described as the first post-Columbian description of the North Atlantic coast, and gives the first description of New York Bay and harbor and the present Hudson River. From there Verrazzano sailed along Long Island Sound to Block Island and Newport, of which he makes mention. 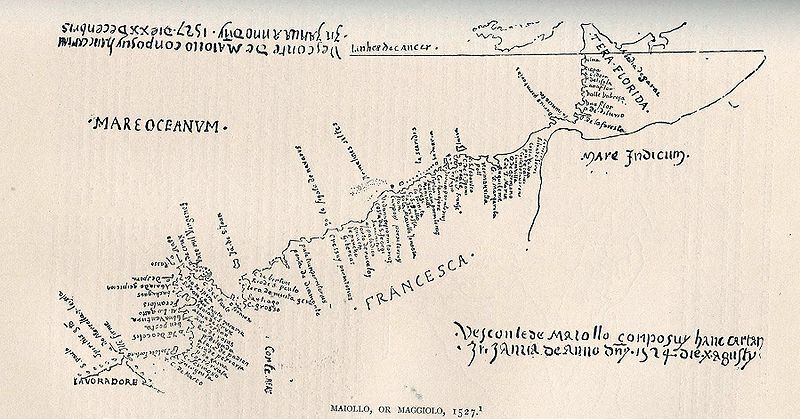 From this notebook of the voyage his brother Hieronimo drew in 1529 a map of the North Atlantic coast, which is now in the museum of the Propaganda at Rome, and testifies to the accuracy of Verrazzano’s observations along the coast as far as a point in present-day Maine, after which he returned to France, arriving at Dieppe in July, 1524. His brother’s map marks as “New France”. Verrazzano lingered in Narragansett Bay for two weeks and in historian George Washington Greene’s retelling, the explorer “continued his observations upon the country and it’s inhabitants…he made several excursions up Narragansett Bay, and examined it with considerable attention. To those who have traced the windings of it’s lovely shores, his rapturous description will hardly seem exaggerated”. But just who were these Native Americans that the explorer described? When I was examining the early lives of the Narragansett, I was told emphatically by Preservation Officer John Brown that the “two kings” written of, by the explorer, were Tashtasik and Canonicus. Knowing that most modern histories claim that these descriptions depict the Wampanoag, I delved further into the known histories. Based upon the description of these people, I encountered both similarities and some differences in other authors writings of the indigenous people of the area. It will be noticed that nowhere in his description does Giovanni di Verrazzano mention his Native American hosts as having their faces painted in such a manner. Indeed he describes at some length the differences in skin tone among them. While the description of the stag skin worn and the bare-headedness comes closest to the explorers observation, the face painting and bear grease mentioned by Philbrick brings another matter to the surface. The Wampanoags, with encampments at Montop and Sawoms, were more a river people than people of the Bay. The Narrows river empties out into Narragansett Bay just above Montop (Mount Hope) and the Titcut (Taunton) River flows from the east, with Sowams located on a small inland cove that lies at a nearly equal distance between the two tributaries. Living on, and near the rivers; face paint and bear grease would have been everyday protection from flies and “muskeetoes” that those living by the breezes borne in from the Bay would not have had to contend with. Some scholars may contend that the time of year of Massasoit’s visit to Plymouth (in mid-March) would warrant such protection from the cold, and while that may be so, it does not explain Josselyn’s account of faces painted during fair weather. Thomas Bicknell in his History of Barrington (1898), heads Chapter III with the title “Verrazzano visits the Wampanoags“, though without naming sources or any explanation for why he believes those were the people the explorer met, and wrote about in his letter. Of course this description leads to more speculation. Would in fact, the Wampanoag have given the explorer such a prolonged and care-free welcome if they anticipated a counter attack by the Narragansett ? Or would the Narragansett, as the wealthiest nation in the region have dismissed the skirmish over an island never viewed as particularly valuable to them, and feted the visitor lavishly in anticipation of procuring an exclusive trading partner? Could Samuel Eliot Morrison have been thinking of the Narragansett all along? One possibility remains, that in encountering tribes nearby those who he first met, the explorer assumed the Native Americans were of the same tribe, though as we know there were several tribes that inhabited the region of the Bay. Wroten, William D. “Verrazano’s1524 Letter…” Edward H Nabb Research Ctr.